A sensitive subject to most is butchery. However, to truly understand where food comes from, this is one other step closer. When you see a whole animal pretty much in tact in front of you, it can be off-putting at first. That's why I became a vegetarian for a year at the beginning of university (well, for that as well as the fact that industrial factory farmimg of animals is shocking and revolting beyond just the slaughter of an animal). Knowing and researching a lot about the dietary requirements of a vegetarian, I spent a lot of time making sure I got all the missing nutrients I needed from my lack of meat intake. Coincidentally, it also forced me to learn how to cook (since I grew up in a Serbian household and eating vegetarian wasn't a thing.. except on religious fast days, of course). Unfortunately I didn't feel great. I became extremely weak for another 5 years afterward and have struggled to recover my strength. Such is life (although a lot of it was due to what I now know as being a gluten-intolerance). The next best thing one can do is to source locally and ethically raised and slaughtered animals. It's not enough to just look at a package and see whether it says organic or not. A lot of standards for rearing animals in the 'Western' world force small farmers to need extremely expensive and high tech slaughter houses and butchery buildings if they wanted to be farm-to-shop butchers. That being said, the organic meats you find in stores doesn't guarantee you a 'happy cow/pig'. Author, Michael Pollan, illuminated this for me when I read his book, The Omnivore's Dilemma. He's made waves by saying that many certified-organic farms and feedlots aren't improvements over industrial agriculture, just imitations; to get a piece of the financial premium that organic foods command, farmers simply substitute organic fertilizers and pesticides for synthetic ones. They use as much fossil fuel to produce and ship the food, and certified-organic animals on big farms and feedlots live and die under the same inhumane conditions conventionally raised animals do. The only difference is that their feed is organic. For more, check out an interview with him here. 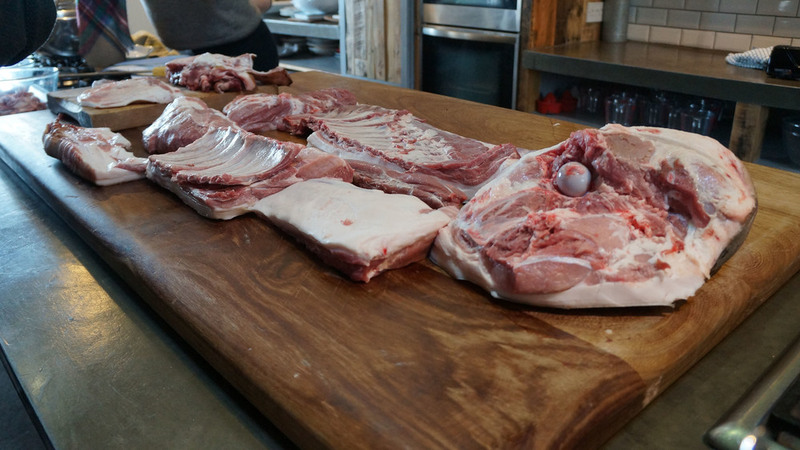 All of the items we learned to make during our butchery course including salami, bacon, terrine and how to make and use lard, pigs ears, you name it! Farmer's markets are the best places to acquaint yourself with a reliable meat producer, who are more often than not, certified organic! The next step then is to learn some basic butchery and cookery skills. Often, the cheaper cuts of meat are the best if you know how to cook them right! Ox Tail Stew, anyone?